Bonsai is the art of making a small, young tree or shrub appear to look much older. The Chinese and Japanese practiced the art of Bonsai thousands of years before visitors brought miniaturized trees to the west. The practice of bonsai preserves a tree’s energy and helps it to live longer. Because of this it is not unusual to see Bonsai trees that are hundreds of years old. Making a bonsai is an involved process of root and leaf pruning and watering. Select a tree specimen for your bonsai. Good specimens include scrubby evergreens such as juniper, shrubs like the azalea and dwarf trees like some varieties of the Japanese maple. One good source for trees is the rubbish heap of a garden center. Garden centers discard young trees that have asymmetrical shapes because they are not suitable for landscaping. But these trees make interesting bonsai shapes. A garden center may sell a tree such as this for a deeply discounted rate, or may simply give you the tree. Plant the tree in a bucket with a good potting soil to develop roots quickly. You will leave the tree in the bucket for one year. During this time, begin to train the tree by pruning away branches and wiring the tree into shape. Remove branches that are directly opposite one another and loosely wrap the young, springy sapling with annealed copper wire. Bend the wire into the initial shape of your bonsai. Loosen and rewrap the wire every few weeks as the tree begins to expand in girth to avoid girdling. Create potting soil for your bonsai by collecting pea gravel, loam and clay. Grade each substance through a series of screens to create coarse, medium and fine grades of soil. The smallest screen should be the size of a window screen, while the largest should have eight wires per square inch. Discard any soil that will pass through the smallest screen. Soil this small will compact around the roots of your plant and kill it. Choose a bonsai container for your tree. A proper bonsai container is typically a shallow ceramic tray only a few inches deep. The tray should have holes in the bottom that you can wire the roots to and attach the tree to the tray. Place a large screen with eight wires per square inch in the bottom of the tray and place the coarse layer of soil onto the screen. 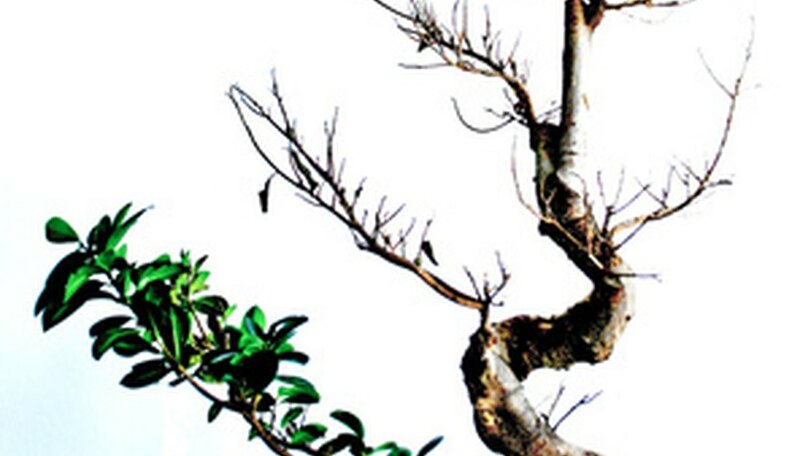 Prune back most of your tree’s top growth one week before transplanting the tree. Lift your tree from its container and trim the roots from the end of the root system with bypass hand pruners. Remove the roots back to the main horizontal members and feeder roots. Spread the root system over your tray and position the tree slightly off-center of the tray. Wire the roots into place by inserting an insulated electrical wire through the holes at the bottom of your tray and wrapping them around the largest roots of the tree. Place the medium grade soil over the roots and work the soil around the roots with a chopstick to remove air pockets. Cover the medium grade soil with a layer of fine grade soil and then cover with moss. To give the tree an aged appearance, leave about 1/3 of the top roots uncovered. If you choose to add an accent, such as a large rock, place the rock into the soil at the time you arrange the root system. Pinch back leaves and needles to the petiole where the leaf or needle attaches to the branch. The leaf will grow back from the petiole in a smaller size proportional to the tree’s miniature height.